The story of Pocahontas and the Jamestown settlers, including the infamous John Smith, is one that has been fictionalized in its many retellings. The truth is that Powhatan and the English settlers were not getting along. Pocahontas was a young girl of 10 or 11 and very interested in these new people. She was said to be curious and generous towards the English settlers, often bringing gifts to them at Jamestown (Southern 220). Pocahontas was very dear to her father and many have claimed that she was his favorite daughter. As the story goes, the brave Pocahontas saved Captain John Smith’s life by warning him of a trap set out for him by her father Powhatan. Other retellings, including John Smith’s personal account, describe her throwing herself in front of his body so he could not be executed, and Disney’s recreation embellished the truth even more. Pocahontas was tricked into her capture during one of her frequent visits to friends at Patawomeke in the year 1615. Her friend Japazaws had been promised a reward of a copper kettle from Capt. Argall in return for his help in capturing Pocahontas. Japazaws was reassured that the settlers would not hurt Pocahontas during her time in capture; she was simply a tool to create lasting peace between the Indians and the English (LOC). This became more convenient than the English could have ever hoped. They intended for Pocahontas to simply be a tool for barter, but when she converted and married John Rolfe, a truly ideal situation sprang from this union. Japazaws kept his end of the bargain, forcing his wife to cry and beg him in front of Pocahontas to visit one of the English ships. He decided that he would only allow his wife to tour the vessel if Pocahontas were to join her. Pocahontas obliged to go both to help her friend and also because she was curious to see the ship from on board. Once on board, Pocahontas was captured and held, and her friends Japazaws and his wife were rewarded and set free (LOC). In return for Pocahontas’s ongoing generosity and kindness, the English, more specifically Captain Samuel Argall, captured her and held her for ransom. The English intended to return Pocahontas to her father if and when Powhatan returned their fellow Englishmen who had been captured and held captive; they also demanded that their stolen armory be returned and that the Indians supply them with ample corn (LOC) Powhatan refused to be swayed and did not agree to the English settlers’ terms; instead of the full deal he sent back seven men and seven broken guns. The settlers sent him a message reminding him of their terms and stating that they would hold Pocahontas until they received more men, more guns, and a share of corn. Pocahontas became frustrated with her father and at the same time began to accept more English customs. She was treated well during her captivity. She lived at the small town of Henricus under the supervision of Sir Thomas Dale. She was converted to Christianity and fell in love with John Rolfe. 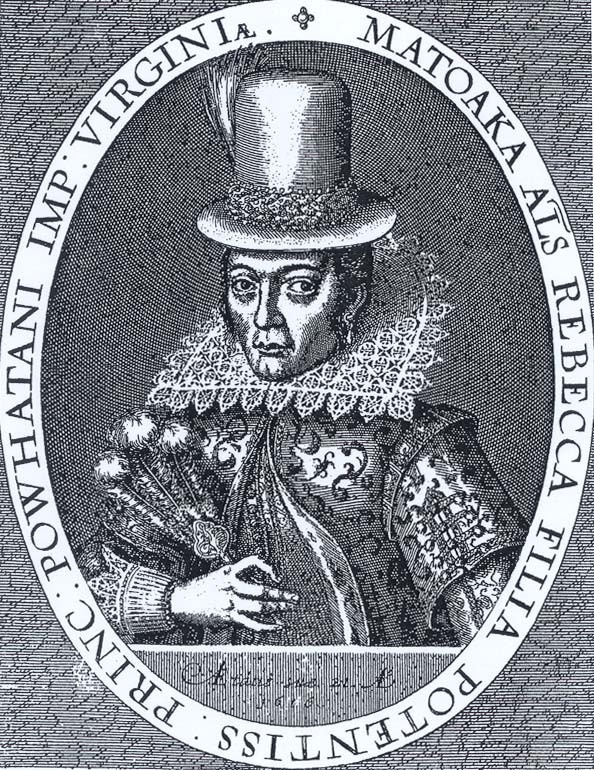 Pocahontas also took an English name, Rebecca, upon converting. Pocahontas and John Rolfe were married in 1614 and this marked the beginning of a new era for white – Indian relations. The Peace of Pocahontas began on their wedding day in 1614 and lasted until the next large-scale massacre in 1622. Powhatan blessed their wedding, which was not the first marriage for either one of them (Southern 222). In 1615, Pocahontas gave birth to a son, Thomas. Pocahontas traveled to England and later died of a disputed disease. Some sources claim pneumonia or tuberculosis, while others say she died of small pox. Historians also dispute about her age at the time of her death. She was either 21 or 22. She was buried in a churchyard in Gravesend, England. Wikipedia, “Pocahontas Original,” http://en.wikipedia.org/wiki/Image:Pocahontas_original.jpg (accessed April 10, 2008). Wikipedia, “Pocahontas Statue at Jamestown,” http://en.wikipedia.org/wiki/Image:Pocahontas_at_jamestown.jpg (accessed April 10, 2008). Chatterton, E. Keble. Captain John Smith. London: John Lane the Bodley Head Ltd., 1927. Custalow, Dr. Linwood “Little Bear” and Angela L. Daniel. “Silver Star.” The True Story of Pocahontas: The Other side of History, from the Sacred History of the Mattaponi Reservation People. Golden, CO: Fulcrum Publishing, 2007. Lemay, J. A. Leo. The American Dream of Captain John Smith. Charlottesville, VA: University Press of Virginia, 1991. Mossiker, Frances. Pocahontas: The Life and the Legend. New York: Alfred A Knopf, 1976. Philips, Leon. First Lady of America: A Romanticized Biography of Pocahontas. Richmond, VA: Westover Publishing Company, 1973. Price, David A. Love and Hate in Jamestown: John Smith, Pocahontas, and the Heart of a New Nation. New York: Alfred A. Knopf, 2003. Southern, Ed, ed. The Jamestown Adventure: Accounts of the Virginia Colony, 1605-1614. Winston Salem, NC: John F. Blair, 2004. “Powhatan’s Daughter, Pocahontas, Taken Prisoner, 1613.” The Library of Congress. http://memory.loc.gov/learn/features/timeline/colonial/indians/prisoner.html (accessed April 1, 2008).